A cookie dough you will happily eat 'raw'! 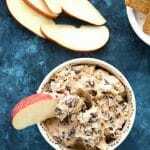 This fall-spiced chocolate chip dip is fantastic with fruit and cookies. Combine the butter, cream cheese and sugars in the bowl of a standing mixer (may also be done with a hand mixer) and cream together. Add the vanilla extract, salt and pumpkin pie spice and mix in. Mix in the chocolate chips. Serve or store sealed in the refrigerator.